Salco P694 STD Standard heavy duty plier stapler. Uses STCR5019 crown staples. Salco P694 STD Standard plier stapler for heavy duty applications such sealing padded bags, corrugated tray or small boxes, and recessed carton ends. Uses JK 694, JK 310, STH5019 & STCR5019 crown staples 1/4" - 1/2" staple leg length. Stainless steel staples are also available. Salco P694 heavy duty pliers staplers offer exceptional ease of operation. 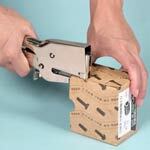 Their powerful clinching action makes this plier stapler a must in every shipping and mail room. Pliers are available in 3 models - standard, sword point and bag sealer. P694 standard plier is similar to Bostitch P6C-8 and Rapid 31. STCR5019 1/2-inch staples. Galvanized. 5,000/box. Salco brand.